I love the changes that come with spring. It’s like the whole world wakes up from a deep sleep. Trees and plants are blooming and springing up everywhere. One of the Bridal Wreaths. My favorites, Azaleas are just starting to get flowers on them. The Bradford Pear Trees around the pond are starting to flower. The Scuplin vine on the hillside has brand new leaves on it. I think this may be one of several blackberry bushes. but they’ve been absent the past couple of years. It’s hard not to love Spring when it heralds the arrival of new life. The ducklings that hatched out a little over a week ago. Ben and her three goslings. has been parading them around for all to see. This little guy, Hershey, is half of a very playful set of twins. the milk that was used to make our soap. I suppose all of the nice weather we’ve had lately inspired some of the ducks to go on another ramble to the creek. Bop, Bee, Sally, and Randy Roger. and obediently followed me back to the pond. along that section of our land, now. sometime in the future so the State installed the barrier last week. Of course, Grandma and Grandpa, always the well behaved pair, spent their time enjoying the pond while the others were up to their shenanigans. I’m surprised they walked down to it because our Pekins usually spend most of their time gathered around one of the kiddie pools, but I guess they wanted a little time away from the younger ducks. Welcome to the Funny Farm. I don’t know if it’s the warm weather, the approach of Spring, or what, but our animals have been acting a little out-of-character lately. Solomon in the doe building. First, there’s Solomon. Y’all may not remember him, but he’s the little buckling that was born a few days before Christmas. I know that people usually say that goats are amazing escape artists, and I can’t tell you how many times I’ve heard, “You can’t keep a goat in”. We’ve never had that problem. The whole time that we’ve had our goats they’ve been little angels, even the bucks. That is, until our precious Solomon came along. This one little buckling has managed to escape from the doe pen almost every single day for the past few weeks. We even found him over in the buck pen one day (I still haven’t figured out how he got over there, but there he was bouncing around with the boys) and a few times down at the little garden bridge by the pond. It’s been several days since he last got out, so I think we’ve finally stopped his adventures. As exasperating as Solomon has been, I have to admit, he’s become my favorite goat. 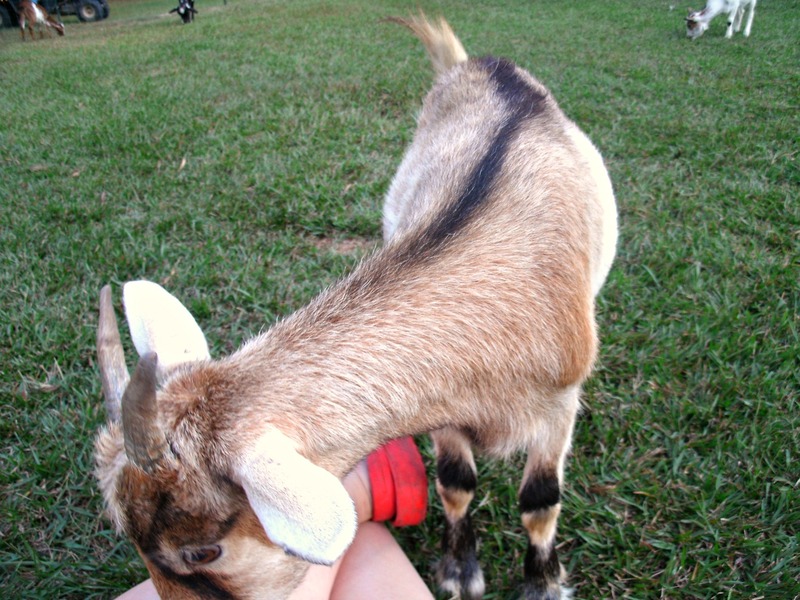 All of our goats are friendly and sweet, but he’s the sweetest one (when he’s not escaping and running amok). He loves to be picked up and held, and begs for attention whenever we go into the doe pen. Next is Benni (or Ben, as we call her). 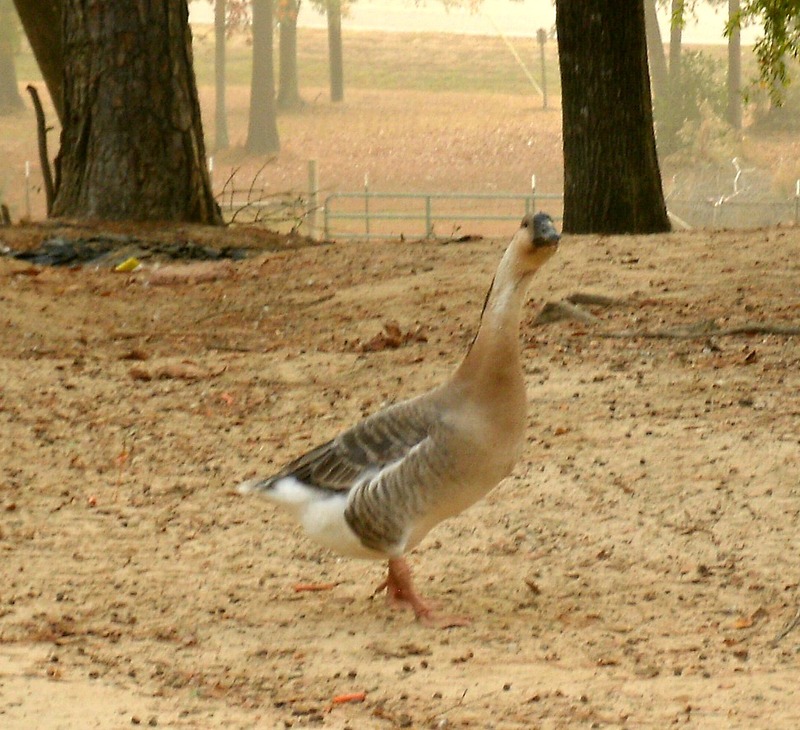 Ben was one of the African goslings we ordered from Metzer’s last year. She’s only a little over seven months old, has laid five eggs so far, and has decided to go broody. She’s got to be the Silkie of geese. She and the Pilgrim goose, Aubrieanne, have always believed they’re ducks instead of geese. They avoid the other geese like the plague, so I’m fairly certain the eggs Ben is setting on aren’t even fertile. I’m thinking about giving her a couple of the Toulouse eggs (which are fertile), so she’ll at least have something to show for her efforts. Ben on a foggy morning in November. Ben isn’t our only bird to go broody this week. We also have two Indian Runners that have decided to indulge their maternal instincts. Runners are known for being prolific egg layers, but rarely go broody. I guess our two girls didn’t get that memo. Come to think of it, one of our Pekins, Susan, went broody last year at about this time, too. 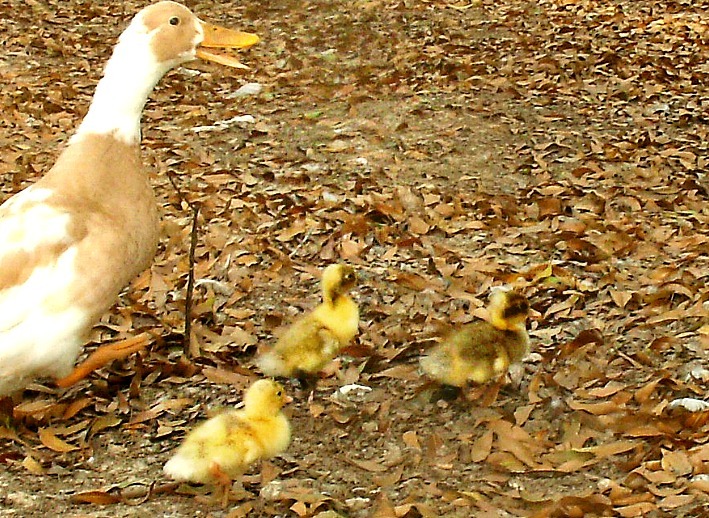 Pekins are another duck breed that isn’t known for their parenting abilities. Susan kept to her nest, and managed to hatch out two very adorable ducklings. If these girls manage to stay on their nests, we should have ducklings in about 28 days. Speaking of ducks. . . They have finally found the pond at the bottom of the hill. Yay! You see, we have the older ducks (two Rouens, named Bee and Bop, and Susan) that we’ve had for a while. Then, we have the ducks that we added last year: a few Indian Runners, a couple of Indian Runner x Pekins, a couple of Pekins, Khaki Campbells, and a pair of Jumbo Pekins (appropriately nicknamed Grandma and Grandpa). Most of those ducks came from a nice lady a couple of towns over that needed a new home for them, and since we were wanting to add to our flock, they came to live with us. 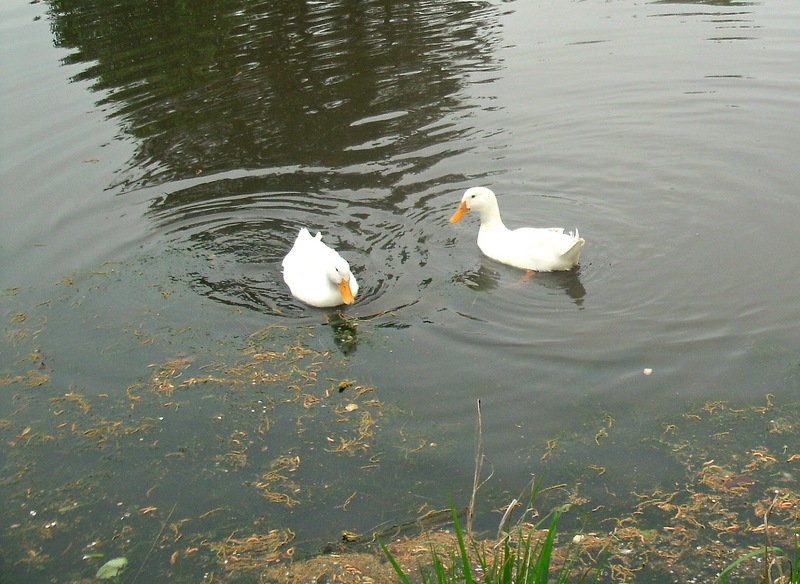 Bee, Bop, and Susan knew where the pond was, and would occasionally visit it during the day when they were free ranging. Somehow, they forgot to share that information with the others. . .or maybe they wanted to keep their secret swimming hole to themselves. I’ve even tried to lead the newer ducks to it a couple of times with no luck (they made it halfway down the hill, and decided that was far enough). Instead, they have happily made do with their kiddie pools. That is, until this week. I guess the Rouens and Susan finally let it slip (or maybe one of the new ducks surreptitiously followed them down to the pond). There they were one afternoon when we looked out, splashing around and having the time of their lives. It’s got to be a big improvement over the kiddie pools for them, and the best thing of all, no one has to wait for their turn in the water. Three of the ducks enjoying the pond today. The past couple of months I’ve been working on egg ornaments for our Christmas tree and to give as presents to a few relatives and friends. Egg ornaments are made from blown out eggs, which are then painted, decorated, and coated with Mod Podge. We’ve had a surplus of duck eggs the past few months, so that’s what I mainly used. I’ve read that chicken eggs are a little easier to decorate because of the difference in the texture of their egg shells, and it did seem like the few chicken eggs that I did were a little easier. I used a wooden skewer to break up the egg yolk and a syringe to blow the contents out. It makes the whole process much easier. Then, of course, the eggs are rinsed out and dried in either the oven or the microwave. This is right after the first coat of paint. I painted one of the eggs black and covered it with white glitter just to experiment a little (I wish I’d done more that way, because it’s one of my favorites). The eggs are drying on wooden skewers that are stuck into floral styrofoam. 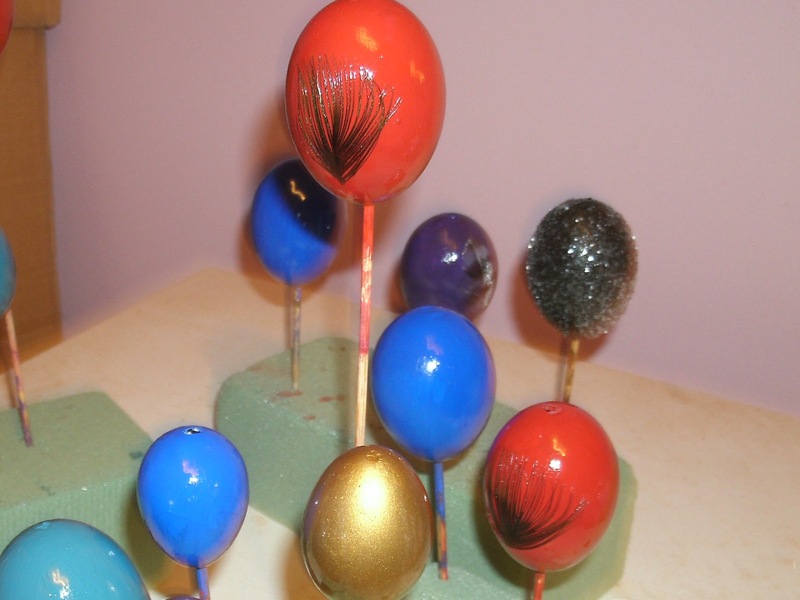 I glued cleaned feathers from our ducks, peafowl, and guineas to some of the eggs as decorations. Other eggs were decorated with rub-ons. After the glue had dried on the eggs with feathers on them, all of the eggs were sprayed with Mod Podge. Once the last coat of Mod Podge had dried, we inserted beading wire through the eggs to make hangers. Beads and bead caps were used to hide the holes on each end of the eggs. I ended up making about 30 egg ornaments in all, and as much fun as it was, I’m so glad to be through. Now, I know this is completely off topic, but I couldn’t resist adding a picture of a little buckling that one of our does had on Monday. 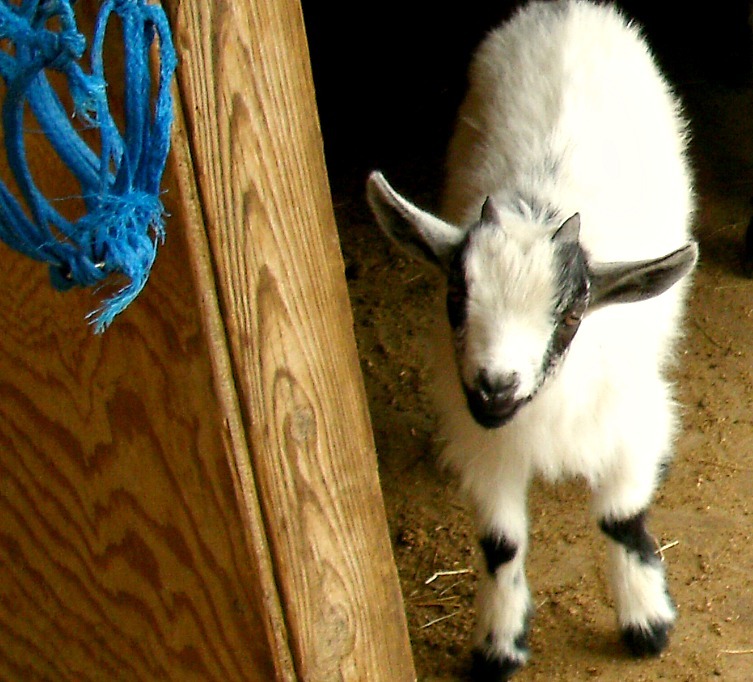 His sire, one of my favorite goats, passed a couple of months ago, so I’m very proud to have this little guy. Right now, he isn’t named, but that will change soon. Little Mose is growing up. 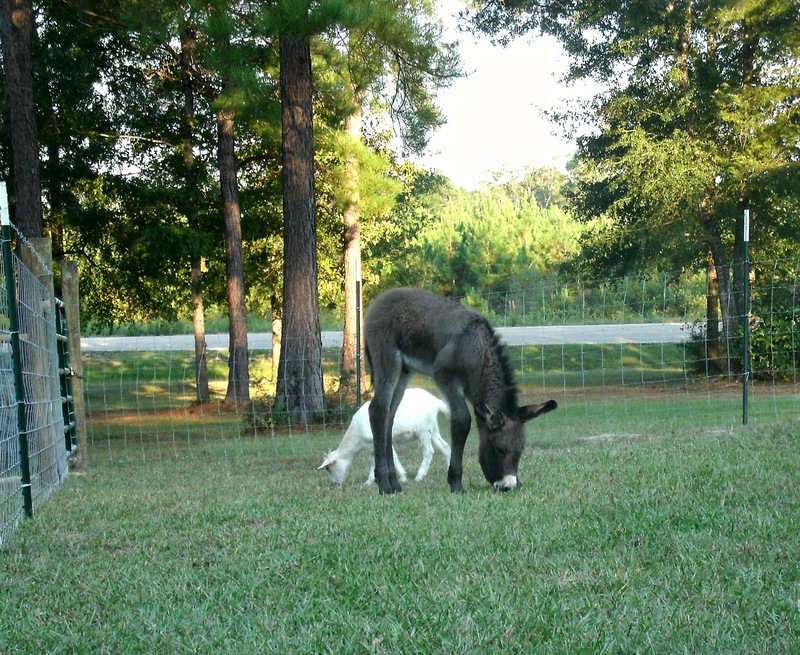 Mose nibbling grass with one of the kids, Rosalie, behind him. 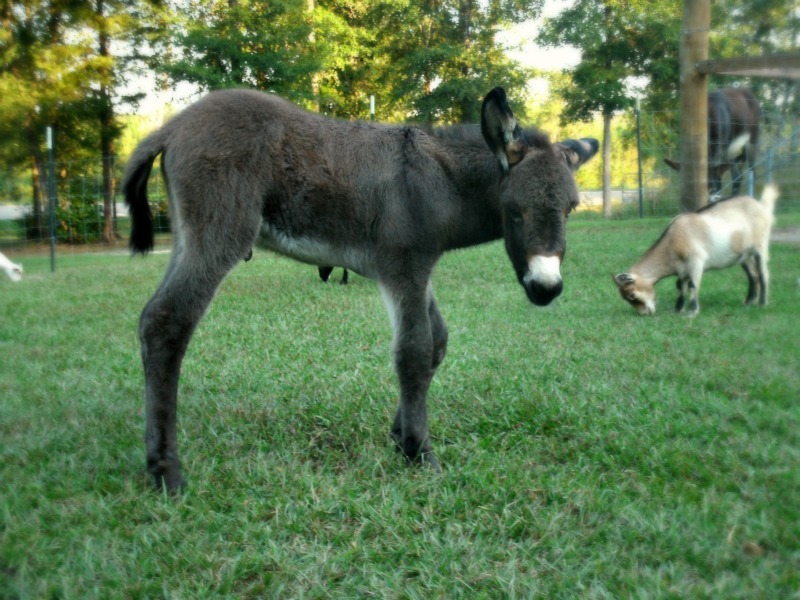 Our little donkey foal, Mose, is almost two weeks old now, and he’s growing so fast it’s unbelievable. I try to go out and spend time with him everyday, and I have to say that’s my absolute favorite time of the day. I love sitting down in the afternoon and watching him explore and interact with Myrtle. Mose has these moments where he’s standing still nibbling grass, and then he looks up and takes off at a full run, zooming around the pen. It’s so funny to watch him bouncing around, mainly because he’s almost all legs. He’s starting to interact with the young goats more everyday. At first, everytime they would try to sniff him or inspect him, Mose would run back to his mother. Myrtle is still such a wonderful mother. It’s so touching to see the bond that she has with her baby. I don’t know if he appreciates it, but I certainly do. I’ve noticed this week that Mose has begun testing his independence by not staying right by Myrtle’s side all of the time like he was before. Mose with Penelope and Myrtle in the background. I couldn’t resist adding a picture of Penelope, my little bottle baby from last year. She was checking to see if I had any more treats.